Emoia cyanura most commonly interacts with other skinks in the genus Emoia, and is often grouped together with the sibling species Emoia impar which shares many characteristics and mainly differs in tail color. These two skinks appear to coexist on all islands they are found on in the Pacific, and actually show signs of habitat partitioning (Schwaner and Ineich 1998) which would indicate a very mutualistic relationship between the two. 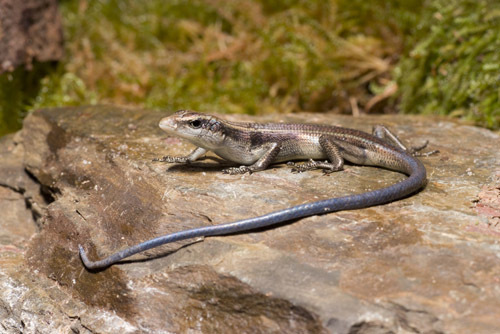 The copper-tailed skink finds competition in the species Cryptoblepharis boutoni; however this appears to only be in the littoral region, the area around the shore (Schwaner and Ineich 1998). E. cyanura like many species is prey to larger animals, for example, in the Fiji islands the re are areas where this terrestrial skink has almost been eliminated due to mongoose predation (Zug 1991). It appears to find itself the prey of fellow members of its genus quite often as well. Researchers have observed E. nigra chasing after E. cyanura, and have found that in areas that have a larger population of E. nigra there is a noticeably smaller population of E. cyanura (Zug 1991). This particular skink can also have potential predators in E. adspera, E. samoense, and E. lawesii (Schwaner and Ineich 1998). In terms of interaction between individuals of the species there appears to be a dominant hierarchy that is portrayed best during sun basking which is popular throughout the class Reptilia, take for example the green sea turtle. The smaller E. cyanura skinks are the first to come out of foliage and find a sun-soaked area to bask, but eventually larger skinks of the species come out and take over these areas (Zug 1991). Return to Homepage. Next page Facts.